The first blog by birds for birds. I'm rather proud of my plumage, if I do say so myself. Anyone have any suggestions for keeping it beautiful this winter in the Gulf? What can humans do to protect birds? 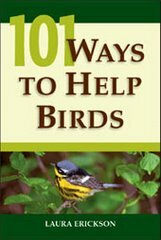 This book tells how people can help us birds. It's really good (honest!) so please read it. Ask the Birds! If you have a question for one of us, send us an email! Every month with a blue moon is National Blue Jay Awareness Month. Who says so? Laura Erickson, that's who! Click here to see more bird photos by Laura Erickson. All the photos on this blog, unless otherwise noted, were taken by Laura Erickson. She's okay as far as people go but, if you can believe this, she's never had a single one of us sign a release form, much less paid us for modeling! Talk about presumptuous! We birds on Twin Beaks would love to see "the Dr. Ruth of Ornithology" teach Stephen Colbert how to explain about the birds and the bees to his son Stephen Jr. before the poor Bald Eagle has to pick up the facts of life on the streets. 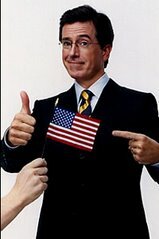 Tell the Colbert Report that they should have Laura Erickson on! Who says we birds don't poop in flight? The world seems like a wonderful place to be! Yes, my head is indeed streamlined. Thought I'd give people a treat! You can send an email to your favorite avian posters via Laura Erickson, who will make sure we receive it. Or just post a comment!